For many years, local conservationists, Sonoma County, and the state of California have sought to protect these six square miles of lush redwood forests and rolling grasslands. The land is adjacent to Sonoma Coast State Beach, California's third-busiest state park, and home to nearly 30 endangered and threatened species. Its watersheds protect streams flowing into the Russian River. 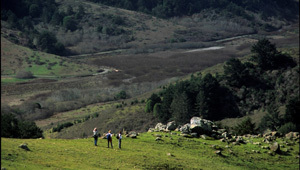 In 2005, after four years of negotiations, we helped add Willow Creek Ranch to Sonoma State Beach in the largest public conservation purchase in the county's history.